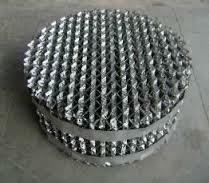 Structured packing’s is a group of elements of specified height made by stacking several crimped and corrugated sheets at an orientation of 90 degree to each element such that it provides good distribution of liquid and gases with minimum pressure drop. Established in 2013, JV Engineering & Construction Company is engaged in manufacturing of Heat Exchangers, Pressure Vessel, etc. We also provide Fabrication Services to our clients.